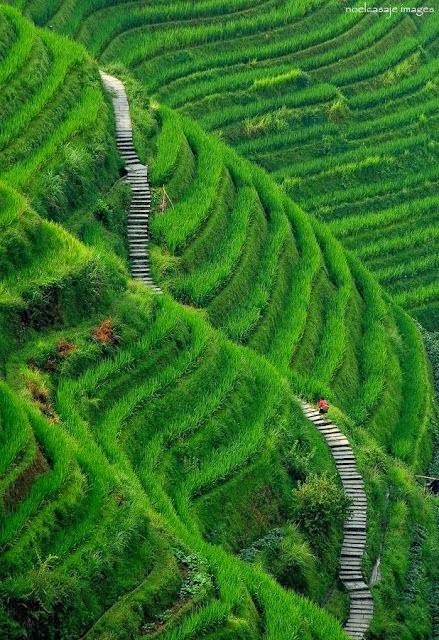 The Longsheng Rice Terraces are located in Longsheng County, about 100 km (2 hours drive) from Guilin, Guangxi, China. The most popular are Ping An Rice Terrace and Jinkeng Rice Terrace. The terraced fields are built along the slope winding from the riverside up to the mountain top, the highest part being 880 m in elevation while the lowest part is 380 m. The coiling line that starts from the mountain foot up to the mountain top divides the mountain into layers of water glittering in the sun in spring, layers of green rice shoots in summer, layers of golden rice in fall, and layers of silvery frost in winter. The terraced fields were mostly built during the Ming Dynasty, about 500 years ago.